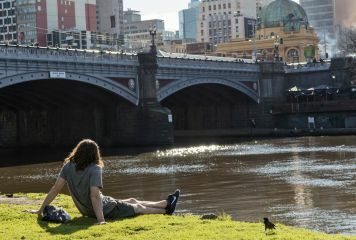 Environmental watering has scoured sediment from pools in the Yarra River, improving habitat for fish, waterbugs and platypus. Fine sediment (silt) is important for a waterway but too much can be a problem1. Without the flow variability provided by natural floods or large environmental water releases, sediments can build up, smothering rocks and snags and preventing the growth of algae that is the foundation of the food chain. Over a long period of time, the build-up of sediment can also reduce the size and depth of pools that are refuges for fish, invertebrates and platypus during droughts2. Floods or fast-flowing water dislodges and moves sediment to deepen pools and improve the diversity of habitat on the bottom of the river. Since 2011, environmental watering has helped maintain the river channel by moving sediments downstream. In September 2011 and July 2012, environmental water (200 and 300 ML a day respectively) was released by Melbourne Water to improve habitat downstream of the Upper Yarra Reservoir. Each release lasted about three days. In part of a surveyed pool, these water releases eroded up to 98 percent of the bed sediment, see Figure 1 below. Between the large 2011 and 2012 water releases, smaller environmental water releases, of less than 60 ML a day, further reduced sediment and created in-stream habitats by providing a mixture of river flow rates and depth essential to fish, plants and waterbugs. This highlights that even small environmental water releases scour the channel. When water levels recede, the river flows slowly again, allowing sediments to redeposit. Regular environmental watering is important in the Yarra River to help maintain a continuous process of sediment scouring and deposition. Environmental watering since 2011 has increased the availability of pools and riffles (shallow sections of rivers with a rapid current) for fish and waterbugs, helping reduce terrestrial vegetation encroachment and helping maintain the dimensions of the river channel. This benefits a wide range of plants and animals including waterbugs, native fish (such as river blackfish and Macquarie perch), and platypus3. 1 I. P. Prosser, I. D. Rutherfurd, J. M. Olley, W. J. Young, P. J. Wallbrink & C. J Moran, 2001, Large-scale patterns of erosion and sediment transport in river networks, with examples from Australia. Marine and Freshwater Research 52: 81-99. 2 Bond, R. Nicholas and Barbara J. Downes, 2003, The independent and interactive effects of fine sediment and flow on benthic invertebrate communities characteristic of small upland streams. Freshwater Biology 48: 455-465. 3 Tonkin, J. Kearns, J. O'Mahony and J. Mahoney, 2015, Spatio-temporal spawning patterns of two riverine populations of the threatened Macquarie perch (Macquaria australasica). Marine and Freshwater Research.